When people buy homes, cars, or anything that has a lock and key needed to open the lock, most often duplicate keys will need to be made for other members of the family or to have on hand in case of an emergency. Ordinarily, folks go to the local hardware store to get keys made but sometimes people will need to see a locksmith who can cut duplicate keys from electronic keys, chipped keys, or rare keys that go to old houses. However, what do you do when you are in a situation where you just finished shopping, get to the car, and accidentally break half the key off in the lock? Worse, you have a car that doesn't have OnStar or AAA, it's getting dark!? Locksmiths are professionals who have all of their equipment available to handle emergency situations such as keys locked in vehicles usually, in a utility van. This professional brings the shop to the customer and, this article will explain what a mobile locksmith do for people. Locksmiths, who have their shops in vehicles, come out to service people who have issues that cannot be resolved in a brick and mortar facility, such as those involving a house, automobile, or commercial business structure. In the case involving houses, mobile locksmiths are like knights in shining armor who conduct service calls bringing with them all of the tools of their trade needed to take care of problems such as helping people who get locked out of their houses or cars. They also help in gaining entry to a home where a key might be stuck or where a key breaks with a piece still stuck in the lock, install new locks like deadbolt locks to houses that have been newly purchased or burglarized. Another service mobile locksmiths do for people is to assist with purchasing quality lock and key products for those who purchase buildings for their businesses. Their clients will most often need the services of a mobile locksmith as a part of a team to provide services needed with regards to security. The services they provide involve the installation of regular key locks, key coded locks, locks that would require chipped keys, and electronic locks requiring specially programmed key cards. Also, these traveling locksmiths are best able to provide services to their clients in much more flexible ways than that of brick and mortar setting. In fact, some of them run their entire business from their vehicles. The advantages they have in running their business from their vehicles are as follows: they can set their own business hours and days of operation, they can choose to be on call which opens the door for them to be available after normal business hours and, they can also be available for emergencies just like road services are if the emergency involves keys locked in cars or broken off in the lock. What a mobile locksmith does for their clients is provide services to people, who for various reasons, are unable to go a brick and mortar store. They travel to homes during business hours to help with lock and key issues for people who have private residences or commercial business buildings. These locksmiths run their businesses out of their vans or trucks and have the flexibility to choose their hours and days of operation, whether or not to be on call for after hour issues and for the most part, they are available to respond to emergencies. 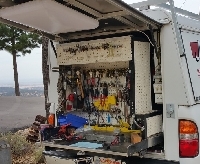 Mobile locksmiths are awesome lifesavers for their clients.